Those new to the writing industry, and even those with some experience), sometimes draw a blank when it comes to certain publishing terms and definitions. Today's post is for you! Here's a closer look at some of the commonly used publishing terms and their definitions. Acquiring editor: a person within a publishing house whose primary function is to identify and negotiate to acquire new titles for publication. Advance: the non-returnable payment to authors by publishers against which the royalty earnings are offset. Bar codes: the machine readable image of lines of varying thicknesses which encodes a book’s ISBN and which is printed on the back cover. When ‘read’ by electronic till equipment it plays a vital part in booksellers’ EPOS systems for sales monitoring and stock control. Berne Conventions: an international agreement made in 1886 for the respect of copyright between participating nations. Bleed: term used for an illustration or image which extends beyond the trimmed page. Blurb: the brief description of a book which appears on the back of a paperback or on the inside front flap of a hardback. Book proof: a specially produced advance copy of the uncorrected text of a title, used by publishers’ sales teams and as early review copies. Book Proposal: Description of a proposed book that an author sends to a publisher, often including sample chapters and an outline. Critique: An evaluation of a manuscript, touching on issues such as structure as well as character and plot development. Commissioning editor: a person employed in a publishing house to seek out authors to write particular books for publication; sometimes used as a synonym for acquiring editor. Contract: the agreement drawn up between the publisher and the author to confirm payment terms, royalty, respective responsibilities etc at the point of acquisition. Copy editor: the person employed in a publishing house who works on the detail of a book, ensuring accuracy and completeness and preparing it for typesetting. Copyright: the right of an author, artist, publisher etc to retain ownership of works and to produce or contract others to produce copies. In 1996, the full term of copyright was extended throughout the European Union to 70 years (previously 50 years in the UK) from the end of the year in which the author died. Consignment: books sold on consignment are not invoiced to the customer but paid for as they are resold. Books consigned in this way are sometimes described as supplied ‘see-safe’. Dues: orders taken before a title is published or while it is for any reason unavailable which are fulfilled when stock is again available. Called in the US ‘back orders’. Endpaper: the pages of heavy cartridge paper at the front and back of a hardback book which join the book block to the hardback binding; sometimes used for maps or carrying a decorative colour or design. Format: the shape of a book defined by its height and depth. Frontispiece: an illustration inserted to face the title page. Half-title: the first page of a book, on which the title is displayed, sometimes with a blurb or quotations from reviews. Imprint:  the name of the publisher under which a title is issued. Increasingly in conglomerate publishing the term represents a publishing brand rather than a publishing company in its own right. also used to refer to the printer’s name and address which by law must appear in all printed books. ISBN: universal abbreviation for International Standard Book Number, a ten digit unique identifier for each title published, which is used in a wide range of applications in all stages of the supply chain throughout the world. The number – made up of a language prefix (0 or 1 for the English language), followed by a publisher prefix, then a number relating to the individual title, and finally a check digit (used to validate the remainder of the code) – is customarily encoded in a bar code printed on the back of the book and normally appears also in the bibliographical details on the reverse of the title page. ISSN: abbreviation for International Standard Serials Number, the equivalent of the ISBN in the journal and magazine publishing business. Large print: editions of existing titles redesigned for reading by those with impaired vision, produced specifically for the library market. Limited edition: a book published on the basis that a stated number of copies will be printed regardless of demand. Such titles are often individually numbered by hand and may achieve rarity value for collectors. Literary agent: a person or company looking after the interests of author clients and managing the exploitation of rights in an author’s work. This includes submission of a book to publishers, perhaps in the form of an auction, negotiating a contract, collecting money due, and dealing with other rights not held by the publisher, such as (in many cases) broadcasting and film rights. Margin: the white space surrounding a page of type. Market:  the potential readership for a title. the territories of the world in which a title may be contractually sold. Marketing: the department in a publishing house with responsibility for promoting titles published; this may include the creation of point of sale display material, press and other advertising, and securing free coverage through PR and publicity. Publicity: the department within a publishing house which organises ‘free’ promotion of titles published, often through the sending out of review copies or soliciting coverage in the broadcast media; often nowadays in larger firms a part of the marketing department. Public Lending Right: the right of an author to receive from the public purse a payment for the loan of works from public libraries. Recommended retail price: the price at which the publisher recommends that a book should be sold; to which the bookseller’s discount is applied and on which the royalty payment to the author is customarily calculated. Recto: the right-hand page of an opening in a book. Reprint: a second or subsequent printing of a title with minimal alteration to the text. Returns: books returned unsold from bookshops to publishers for full credit. Review copy: advance copy of a book sent out without charge to the press or other media for the purposes of review. Royalty: the payment made by publishers to authors and others on sales made; typically a percentage of the recommended retail price in the home market and of the monies received from export sales. These payments are frequently set off against an advance and accounted for at six monthly intervals. Scout: a person employed in an overseas territory to identify possible acquisitions of new titles. Serial rights: a subsidiary right involving the sale of extracts from a title to a newspaper or magazine. Subsidiary rights: rights which are acquired by publishers for subsequent resale, such as serial rights, translation rights, etc. Title-page: the page, normally the second leaf in a book, which displays the title, author and publisher’s name. Topping rights: in an auction the opportunity given by a literary agent to a publisher to match (or in practice increase by an agreed percentage) the highest bid received from other participants. 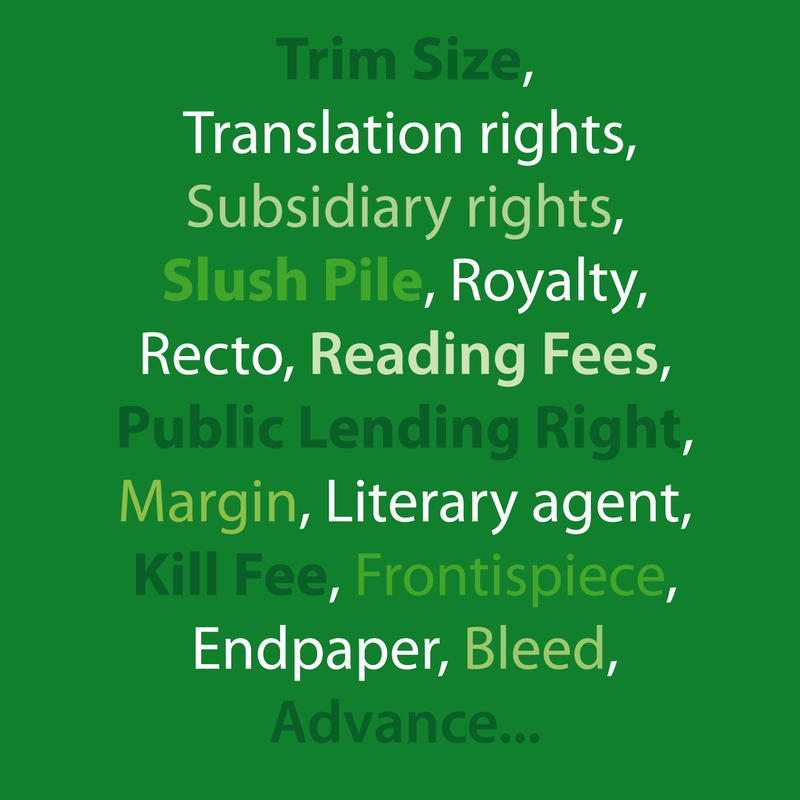 Translation rights: the right acquired to translate and publish a work into another language.